While my homemade, iron on version was a nice starting point, these real-deal tees are ordered and on their way! Make sure you get one before they are gone. These things are bound to be worth millions as a collectable item years from now and are being hand sewn by Swedish elves so committed, they only take short breaks for fiskbullar and Glögg twice a day. 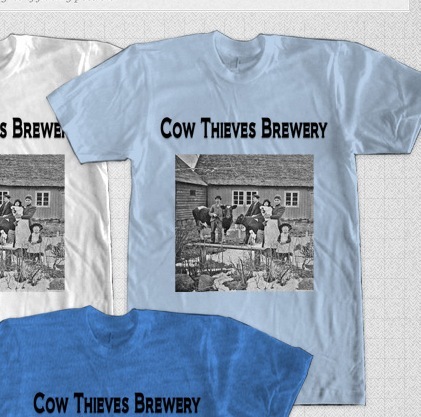 The original cow thieves would be seriously proud! Sign up below and I”ll make sure I hold one for you for only $10. Speaking of Cow Thieves, our summer Saisons are ready to be tested this Sunday and with the labels in print as we speak, it’s sure to be another successful batch. Maybe a six pack Nobler giveaway? Check back soon!